The B.S. in Emergency Services degree program at ERAU is one of just a few university programs to carry the “Certificate of Recognition” from Fire Emergency Services Higher Education (FESHE). That means the curriculum addresses all critical areas that modern fire departments are tasked to perform. Students can select from a specialization in Aviation Emergency Management or Fire & Emergency Services and learn from faculty members who have both academic backgrounds and proven expertise as emergency responders. Plus, when students complete courses through Embry-Riddle, they receive a National Fire Academy certificate just as if they completed the courses at the National Fire Academy. As members of the ERAU network, students get the chance to collaborate with colleagues, leadership, and other professionals in their own organization’s communities while completing coursework. Students can also take advantage of ERAU’s partnerships with the Dallas/Fort Worth Fire Training Research Center (DFW FTRC) and the Aircraft Fire Fighting (ARFF) Working Group to develop and carry out research projects. Concepts covered include human behavior, structures and systems, prevention, protection, investigation and analysis, organization and management, research, administration, hazardous materials, personnel management, political and legal foundations, terrorism, community risk reduction, disaster planning and control, system design for life safety, occupational safety, and human program management. The Bachelor of Science in Emergency Services has both International Fire Service Accreditation Congress accreditation and FESHE Recognition. Learn more about Embry-Riddle’s accreditation. Students can strengthen their emergency management knowledge base by adding several minor courses of study based on the student’s specific area of interest. The Bachelor of Science in Emergency Services degree broadly encompasses all emergency service response disciplines in public and private sectors including: fire, emergency medical, investigation, engineering, aircraft rescue and firefighting, environmental, hazmat, inspection, dispatch, security, OSHA, instruction, public information and wildland firefighting. The curriculum design for this degree is based on in the National Fire Academy’s Fire and Emergency Services Higher Education (FESHE) Model Curriculum for a Bachelor’s Degree. Beyond the six FESHE core courses, several additional ERAU-developed courses have been approved for students to receive NFA certificates — this is a unique advantage of taking classes at ERAU. Aviation Emergency Management Specialization has a focus on aircraft accident investigation, airport emergency management, aviation safety, and leadership in emergency response organizations. 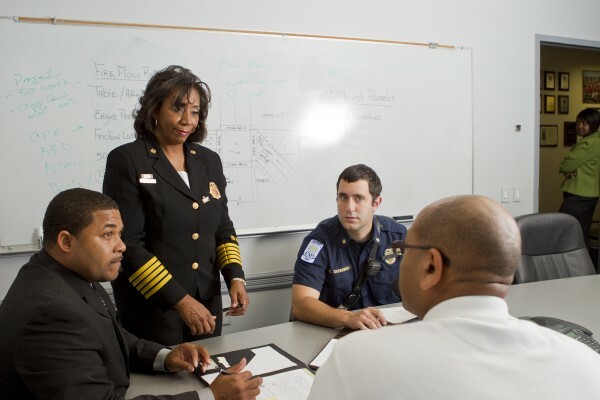 Fire and Emergency Services Specialization focuses on emergency response administration, management, leadership, community risk reduction, and operational issues in emergency services. The Bachelor of Science in Emergency Services is 100 percent online — a perfect option for anyone juggling the demands of working full-time, shift work, and/or family life. With this flexible learning environment, ERAU encourages students to continue working throughout their studies. This degree program participates in the Air University-Associate to Baccalaureate Cooperative (AU-ABC Category I). All students who have completed a Community College of the Air Force (CCAF) associates degree in Fire Science and Emergency Management are eligible. CCAF graduates can complete a Bachelor of Science in Interdisciplinary Studies by taking no more than 60 semester hours beyond their CCAF degree. The B.S. in Emergency Services (BSES) degree program provides students with the theoretical foundations for leadership and administration in fire and emergency services response organizations. The curriculum includes the principles, theory, and practices associated with today’s emergency response professionals. The program is regionally academically SACS accredited and FESHE recognized. The BSES degree broadly encompasses all emergency services response disciplines in public and private sectors including: fire, emergency medical, investigation, engineering, aircraft rescue and firefighting, environmental, hazmat, inspection, dispatch, security, OSHA, instruction, public information, wildland firefighting, etc. Concepts covered include human behavior, structures and systems, prevention, protection, investigation and analysis, organization and management, research, administration, hazardous materials, personnel management, political and legal foundations, terrorism, community risk reduction, disaster planning and control, system design for life safety, occupational safety, and human program management. The curriculum design for this degree is based on in the National Fire Academy's Fire and Emergency Services Higher Education (FESHE) Model Curriculum for a Bachelor’s Degree. When students complete courses through Embry-Riddle Aeronautical University, they receive a National Fire Academy certificate just as if they completed the courses at the National Fire Academy. Beyond the six FESHE core courses, several additional ERAU-developed courses have been approved for students to receive NFA certificates—this is a unique advantage of taking classes at ERAU. The Bachelor of Science degree in Emergency Services is one of only a handful of programs around the world to have regional accreditation by Southern Association Colleges and Schools (SACS), International Fire Service Accreditation Congress (IFSAC) accreditation and FESHE recognition which all lead to demonstrate our programs excellence and student dedication. There are two specializations currently offered at the baccalaureate level: Aviation Emergency Management, and Fire and Emergency Services. The Aviation Emergency Management Specialization has a focus on aircraft accident crash investigation, airport emergency management, aviation safety, and leadership in emergency response organizations. The Fire and Emergency Services Specialization focuses on emergency response administration, management, leadership, community risk reduction, and operational issues in emergency services. This degree program participates in the Air University-Associate to Baccalaureate Cooperative (AU-ABC Category I). All students who have completed a Community College of the Air Force (CCAF) associates degree in Fire Science and Emergency Management are eligible. CCAF graduates can complete a Bachelor of Science in Emergency Services by taking no more than 60 semester hours beyond their CCAF degree. Students are allowed to utilize their elective credits to select any Minor offered in the catalog. In December 2017, a power outage interrupted operations at the world’s busiest airport – grounding at least 1,500 flights and disrupting travel for an estimated 30,000 passengers traveling through Hartsfield-Jackson Atlanta International Airport. While airport emergencies can present unique logistical challenges such as fleet management and passenger safety, emergency management leaders in the U.S. are guided by a standard set of procedures set by the Federal Emergency Management Agency.